Meet Mr. TV. Although I seriously doubt that's the name on his birth certificate, it's the only name he provided. After a quick Google search, I found that he is undoubtedly, the Mr. TV, comedian and street performer; his given name is rumored to be Jason Hypercleats, but even that sounds like an alias [source]. 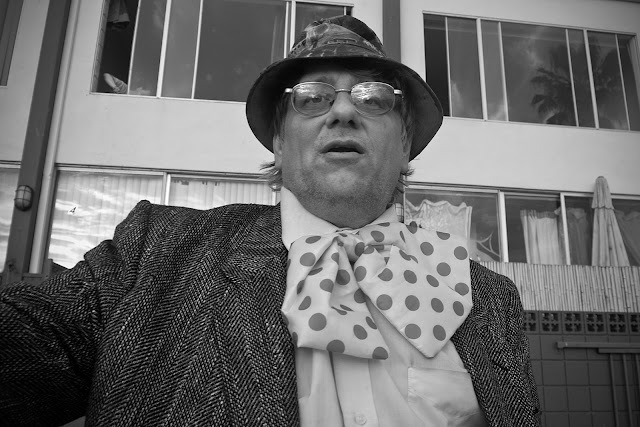 Mr. TV has been doing comedic street performance since 1998 and is usually associated with his television screen framed performances. However, my encounter with him was sans television frame and with a new routine he was trying out. If you would like to watch Mr. TV's act, you might be able to track him down at the Venice Beach Boardwalk or, if you're too tired to make the trip, you can just click through to youtube here. In case you're wondering what this post's heading says, that's a 5 in 5 of 100. What a strange looking character design. I think someone dropped a number in their font. If you'd like to know more about the 100 strangers project, the challenge can be found over there. Although my 100 strangers project can only be found here.